Waikiki Elementary, a Mindful School, on the slopes of Diamond Head Crater in Honolulu, has embraced the Habits of Mind for over 20 years. The results have been remarkable. More than instructional strategies, the Habits of Mind are infused into the organizational norms and are shared by the instructional and support staff, the students and the community—they live the Habits of Mind. The mindful culture has endured through three changes in principals and numerous new additions to the faculty. Current 2014 student proficiency and growth scores are the highest in the state and the school has recently been awarded $15,000 and honored as a “recognition” school. How did this highly effective learning community evolve despite serving a challenging student population with 38% economically disadvantaged, 30% English language learners, 40% nontraditional families, and 50% K students lacking readiness skills upon entry? Participants readily attribute the school’s success to its “mindful” culture. Author Daniel Pink says, “The future belongs to people who know how to learn and have the drive for continuous learning baked into the soul of their being”. At Waikiki School, the Habits of Mind “bake in this spirit”, creating an active learning community where innovation, growth, and caring are the given. 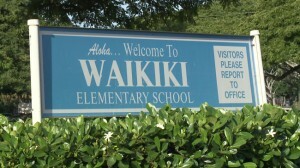 The Waikiki School story began back in 1992 at a retreat convened by the School Community Council. At this retreat, grassroots school pioneers crafted Waikiki’s vision and mission. Early school pioneers connected with Dr. Art Costa whose work with the Habits of Mind (HOM) provided a perfect fit for the school to bring this vision to life. Providing the philosophical foundation and common vocabulary, the Habits of Mind incorporated the school’s vision with the tools to “make it happen”. Over the years, Waikiki School has established artifacts, practices, and symbols EVERYWHERE to support the mindful culture by making it visible and fully integrated into the “life world” of the school. T-shirts, benches, stationary, murals, mindful assemblies, and a multitude of activities provide real life settings for HOM to be recognized, practiced and refined. For example, the school’s gardens, organic food farm, and a fruit tree orchard of 63 trees provide a natural expansion of the mindful school vision with multiple opportunities for students to connect with the land, their food and each other. Projects in farming, recycling, composting, waste management, alternative energies provide a wide range of opportunities to pursue the application of the Habits of Mind. 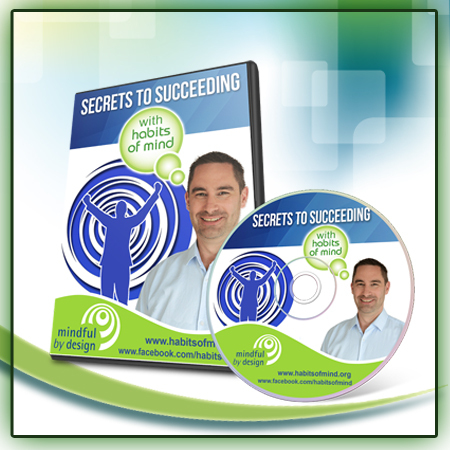 “One beauty of the Habits of Mind is that they can be applied in any context. Through our Waikiki Food Farm, we’re always looking at opportunities to teach the Habits of Mind and apply them to real life situations beyond the classroom walls. For example, we have our kids write about how they’re going to use one of the Habits of Mind out in the garden, and then at the end, write a reflection on how successful they were at using that particular habit during their experience. Another opportunity is when we send home harvested produce and ask families to post the recipes they create and journal about the habit they used in preparing the harvested produce for their family meal”. Harvesting the produce they have grown and eating the fish they have nurtured, greatly reduces the appeal of fast food. Healthy options become the desired alternative. Environmental stewardship and sustainable practice seamlessly expand the mindful school vision and provide countless opportunities to bring the Habits of Mind to life through active project based learning. The continued practice and evolution of the mindful culture over the years has yielded remarkable results. On school quality surveys, parent satisfaction measures are a whopping 96%, with teacher satisfaction measures even higher! In addition to becoming recognized for the second time as a 2013 National Blue Ribbon School, the school was further honored by having one of its teachers selected to serve as the Hawaii State Teacher of the Year. Current 2014 student proficiency and growth scores are the highest in the state. The chart below illustrates student progress over the past 11 years. It All Comes Back To The Mindful Culture! The Habits of Mind drive all that we do. We model, teach, talk, integrate, and deepen our connection to the Habits of Mind at every opportunity. In closing, perhaps the best part of it all may be the infectious, highly energizing, culture that results. Morale is soaring. The Waikiki School family (students, teachers, staff, parents, community) uniformly feel lucky and privileged to be part of this active learning community where innovation, growth, and caring are the given. The Habits of Mind, infused into the lifeblood of the school, translate the ideal of lifelong learning into the reality we experience on a daily basis—and this translates into an exceptionally empowered community of learners whose quest for growth and love of learning is deeply “baked into its soul”.